We’re sure you’re probably subconsciously aware of it when you shop in the supermarket or at your local butcher…you’ve likely glanced at it hundreds of times while at the meat cabinet pondering over which delicious cut of beef or lamb you’re going to purchase for the week...we’re talking about the Quality Mark. 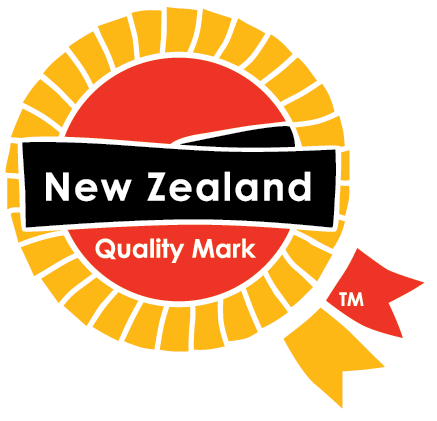 The red and yellow rosette on New Zealand beef and lamb. This might evoke some emotions in you, makes you feel patriotic and gives you a reassurance that you are eating meat grown lovingly in your own back yard, grass fed, free from antibiotics, tender and delicious. Perhaps it means less to you, just simply offers a reassuring familiarity and whilst you don’t really know what it means to you, you just know it means something good. A bit like those favourite track pants at home, you’re not sure why they are so important to you – they just are. Or perhaps it means nothing to you, perhaps it’s another label on an already busy piece of packaging. Well regardless of which person you are, we thought it would be worthwhile telling you why the Quality Mark came into existence and why it is still as relevant today as it always has been. Rewind back to the mid-1990s and the quality of New Zealand’s beef and lamb was to be frank, quite poor. It was inconsistent, often tough and we realised we could do better by New Zealanders. So, we introduced a set of standards that beef and lamb has to meet to get the mark; New Zealand grown, free range, tender, free of hormone growth promotants (hgps), processed under the highest animal welfare standards and it has to reach the highest standards of food safety. So just remember, if you want to buy beef and lamb with a guaranteed level of quality and welfare standards look for the Quality Mark. So go and buy your Quality Mark beef or lamb and get cooking... some suggestions below.